Before 2008, it was hard for an individual to invest in over the counter binary options, but now, with the help of online digital option brokers, there are several available online and one of the newest is Opteck.com. Now anyone, beginner or professional can invest by choosing an underlying asset and predicting if its value will be above or below its current market value at various expiry times via Opteck. This broker typically pays out 65% to 85% if the binary option expires “in the money” and about 5%-15% of the investment if it expires in “out of the money”. Below we will cover Opteck’s other features. Stocks – Google, Coca cola, Dell, eBay, HSBC, Volkswagen, Deutsche Bank, Alcatel Lucent, TOTAL, Fiat, BancaGenerali, telecom Italia Ord. 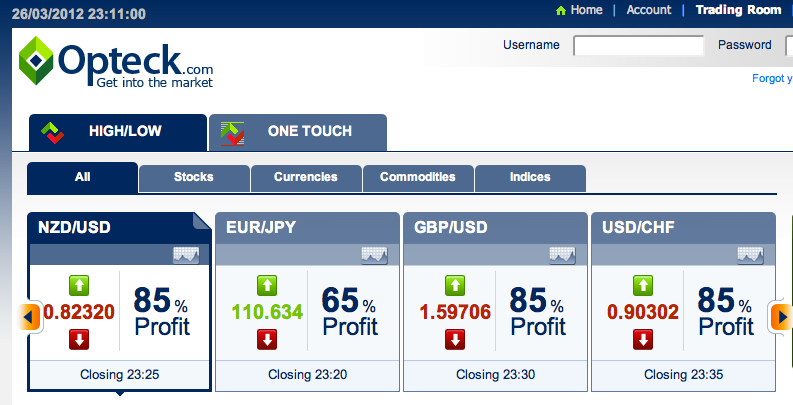 Forex – EUR/USD, GBP/USD, USD/JPY, EUR/GBP, EUR/CHF, USD/CAD. Commodities – Gold, Silver, Crude Oil, Coffee, Corn. Indices – NASDAQ, Dow Jones Industrial Average, CAC 40, DAX 30. Investing is very easy and doesn’t take much time, just select an underlying asset, decide which direction to invest, choose an expiry time and invest. According to the selection made, a fixed amount of money will be given if it the option expires “in the money”. Opteck.com has a very simple and attractive website which provides many features; anyone with basic computer knowledge can access it without any problem. A live account can be opened at any time which requires an e-mail address and some basic information. Trading can be begun right after confirming your account. Customers can contact online and phone customer support at any time. Opteck.com has a user friendly interface which can be used by beginners and experts alike. Beginners in need of some guidance in binary spread betting can have access to trading basics and tutorials provided by Opteck which help newbies become professionals over time. Opteck offers new traders and investors the ability to open and trade with a demo account with $10,000 of virtual money. This is a great way to get familiar with the Opteck platform without incurring too much risk of loss. In order to open a free demo account at Opteck, click here. No trading website is complete without customer service support. To ensure a high level of satisfaction for their customers, Opteck.com has a team of skilled customer service reps, risk management professionals and brokers with years of experience who keep an eye on the market to write live options. For any assistance, there are toll-free numbers for UK clients and international numbers for customers residing outside of the UK as well as online chat support for any customer queries. To provide you with the maximum possible payouts, Opteck.com offers payout rates of 65% to 85%. So, if a person invests $1000 in a digital option that expires in-the-money, then they can expect a minimum of $1650 and a maximum of a $1850 payout. In a case where the option finishes “out of the money,” then 5% to 15% of the investment amount will be returned. 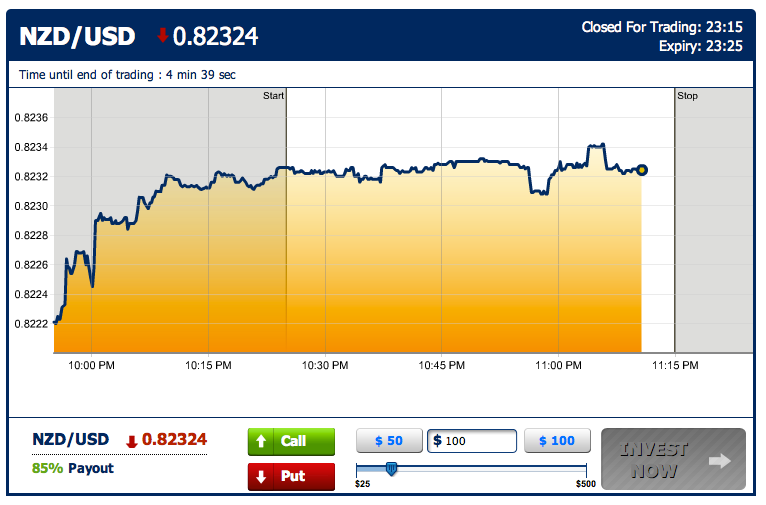 Binary option brokers like Opteck.com has made trading far more advanced and easy. Services and features provided here are of high quality with so much guidance given for beginners as well, anyone with basic computer operating knowledge can now learn to do digital option trading without much problem. A well team of experts, risk management professionals and customer service are also available in opteck.com to help customers at any time. The best feature here is the variety of assets is given to choose from depending on customer’s need. Spread betting was never made this easy to use.